This coming Saturday (by which we mean 1st December) sees a sort of eco-bonanza in Dulwich – fair-trade festivities and eco-friendly gifts galore are being offered alongside Tai’Chi, belly-dancing, story-telling and, most importantly, beer. The organisers are amongst other things attempting to draw attention to a Dulwich-wide initiative to outlaw the plastic carrier bag as a harbinger of evil, and introduce jute or cotton shoppers: as such they have commissioned local school kids to come up with a range of designs. Collectively called SNUB, the sponsors comprise a wide range of local businesses and organisations. Londonist is quietly impressed. We especially like the publicity fliers, which are printed on 100% post consumer waste and use veggie-based ink. And the fact that those who dare to drive to the event will be made to feel plonkers. So for feel-good shopping with tinsel on top, head south east next weekend. 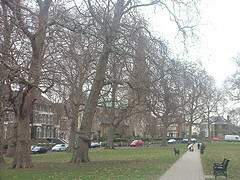 Piccie of Goose Green courtesy of Matthew Black’s flickr stream.